Which job search website is the right one for you? Find out now! Note: 1stWebDesigner launched small little job board where you can find for serious full-time positions in web design and web development field. Check it out from time to time, might find something useful. 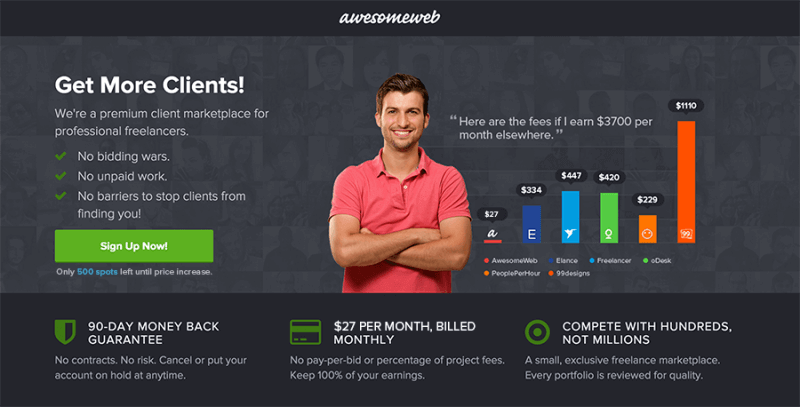 AwesomeWeb has stayed small and expanded slowly. We aren’t greedy. 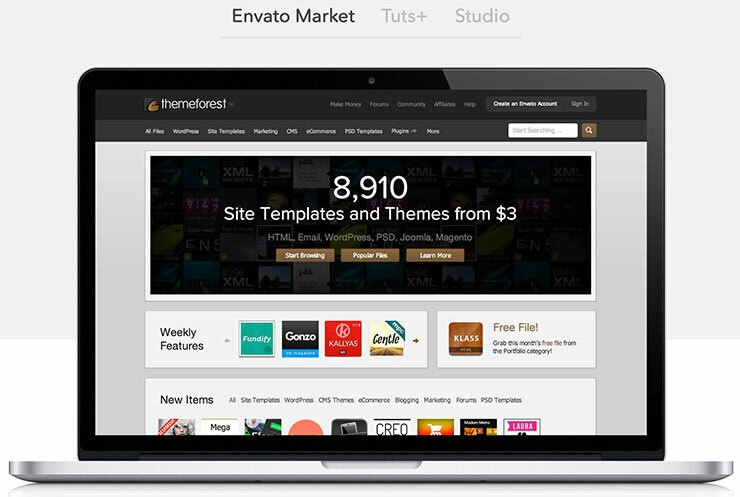 We only ask for a $27 per month subscription and let you work with clients directly. No hidden costs, pure quality – that’s it. Fees. 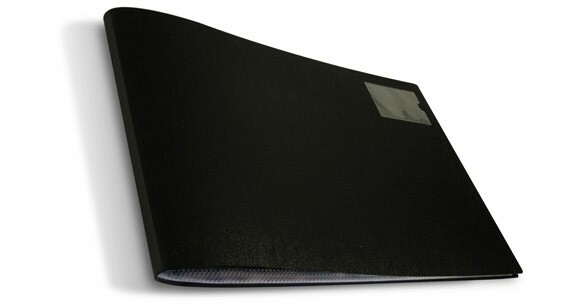 We ask only for fixed monthly payment, $27. It’s not 30% like 99designs or Envato Studio, it’s not 15% or even 10% like in most places. You keep what you earn. You pay upfront. We considered offering free accounts and free trials but ultimately decided on $27 per month with a 90-day money back guarantee. This ensures high quality freelancers. Once you’re in, we support you. It’s impossible to support free users. You can’t reach out to clients yet. Clients contact you. They don’t submit job proposals that you can bid on. In a way it’s nice that clients choose to work with you, but you can feel helpless if you’re not constantly reaching out to clients. We’re building this feature now. Only 500 spots left at $27/month. That’s why we created AwesomeWeb job search website, to provide another, better way for you to find clients and work on projects you can be proud of. We’ll be increasing our prices as we hit our member quotas. The next price increase is at 500 members. Lock in $27/month today. These are the best job boards in our opinion. Now let’s take a look at some more that can help you earn your salary. Nowadays financial issues seem to be a common problem, with everyone complaining about what difficult situations they’re in and how they have no money. This are some more job boards, that can help out. Happy commuting. Even if a quality logo requires a lot of time and work (including research, sketches and drawing) here a logo can be ready in 48 hours (but a competition can last as long as 6 days). A customer writes some lines about his project and the freelancers submit a jpg picture of their work. At the end the customer selects the winner which gives him the original format of the logo.They take a flat commissioning of 29$ for each project, which is paid by the client. The designer is paid via PayPal. Too few projects, this website and the concept itself are good but need some ads and promo. In my personal opinion a place that allows you as a freelancer to present a portfolio is better than one without this feature. I listed Coroflot because of this option, even if it is useful only for designers. Many projects are only for developers.Another con: in order to post a job here you have to pay a lot (265$) and freelancers are free to bid. This website has two ways of navigation: one for employers where they list all the freelancers available (they have also some good filters to find the appropriate ones) and one for freelancers that also has a good layout of their projects and a helpful assortment of categories. There you can find jobs in all fields; soon a blog will help you in your freelancing career on Guru.Freelancers are charged 5% or 10% of the project value, depending on their membership level (basic 10%, guru members 5%). As I was navigating as an employer I saw this title “world’s smallest price”. I believe that as a freelancer that is offensive, they could as well write this ”we have a lot of losers, come on!”. I understand the importance of publicity but morality is a must not an option. For freelancers they posted an interesting title “Be one in a million, not one of millions”. Superb organization for employers and freelancers! With two or three clicks every job in your field is presented in great detail. As a personal opinion, the design of the website is very good. A very important advantage is that the offline contact is permitted, so a very long collaboration is encouraged.Surprise, everything is free! Freelancer and Guru take a small amount of money when you win a project, but to bid is free. iFreelance take a monthly charge for participation as a bidder. SmashingJobs is a part of the well-known website SmashingMagazine. 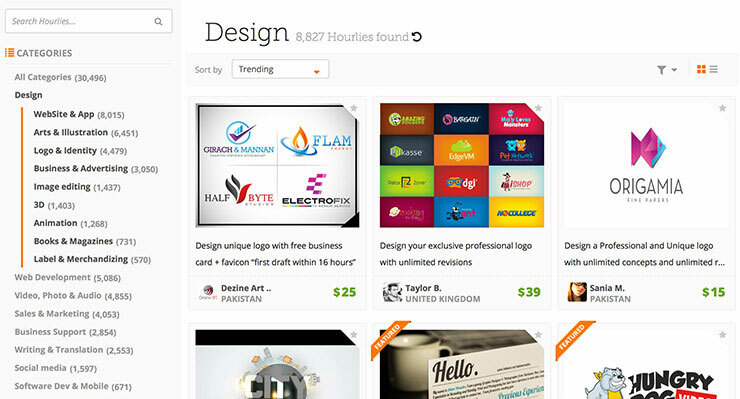 Here you can find some freelancing projects and also many full-time jobs. As a part of such an important online resource for designers and developers it is pointless to comment on the opportunities that can be found here. The prices are not shown, as they are agreed upon between client and provider. Also SmashingJobs has no profit from future contracts between freelancers and customers. 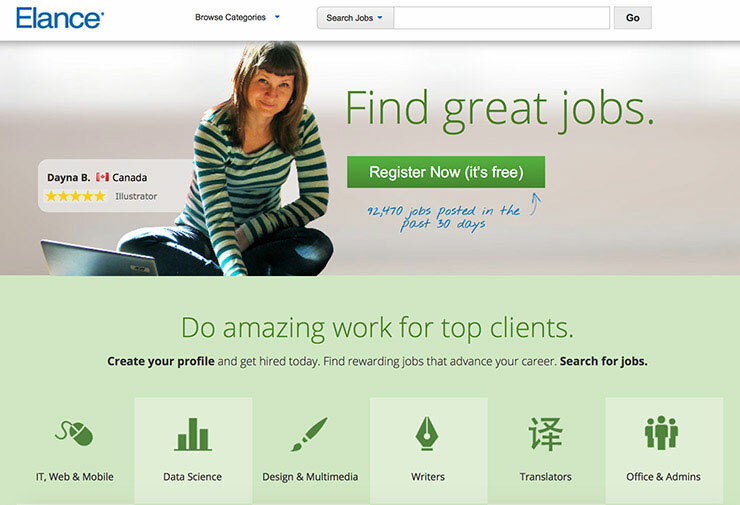 SmashingJobs is perhaps not a market targeted at freelancers, but it has some jobs for them. Anyway if you can’t find jobs her, you can at least find very good resources, articles and tips. Freelancing is a tough profession, but hopefully these will help you to get more out of it and make your journey fulfilling. To make sure of it we are also covering how to get the best out of the sites listed above. If you work as a freelancer you will most likely have quiet periods sometimes. During holidays or just occasionally there will be a dry period where the projects are fewer. But do not fret! Here is a collection of useful things you can do to take advantage of the extra time and get more things to do! Do you have days where the work just isn’t there? Maybe your clients require you to work more in some periods and hardly have anything for you to do during summer or holidays. Optimally you would want a steady supply of projects during the year. Once you’ve worked freelancing for a while there’s a good chance you will succeed on just that. But it takes some practice and long-term planning to be able to adjust this. Once you’re there you will be having things to work with on a steady basis. You probably won’t be lucky enough to have it like that for quite some time though. Building up a steady, healthy pool of clients and projects takes time. Succeeding as a freelancer takes a lot from anyone and you need the ability to adapt. If you just sit around feeling like a failure or worrying about the future once you have some days without work, you will ruin a lot for yourself. Instead you should have a list of things you can do to take advantage of the time to get things done. Here are 15 tips on what you can do on slow days and in dry times. I hope these are useful to you! Not having any short-term deadlines coming up doesn’t necessarily mean that you have nothing to do. Using this time when things are going slow to work on more longterm projects you have engaged in will save you time later on. If you have any long-term projects going on you should work on them if possible. I’ve done this several times in the past, thinking that I had “nothing to do” for a few days just to realize that I had tons and tons of work that had to be done later on that month or a few months later. Having a deadline does definitely not mean that you have to wait until you close up on the deadline. It sounds so logic but can be easily forgotten. You computer, office space and more. Backup and clean up. If you have time and interest for doing a whole spring cleaning you should check out my post “Spring cleaning for Freelancers and Creatives” for some useful tips that can and should be used regularly all year round. Find new ways to promote yourself. Try to think a bit different from what you’ve done before. Make sure you are represented in social media, make special offers, try new ways of advertising. Have a look at the money you’ve spent marketing yourself and decide if you think this is enough. Maybe you can do some adjustments here for the future that will help you get more paid projects throughout the whole year. Read other peoples blogs and websites and find out what they do. Maybe you realise that there are other things that can be part of what you offer. Don’t let your mindset stop you in thinking of new ways of adding to your assortment of services. The brainstorming process around this can be very rewarding in many ways. Examples of side-niches can be if you are a photographer experiencing slower times in the summer realizing that you do have the skills to do wedding photography or take pictures for newspapers and magazines. If you’re a web designer maybe there are classes at a local school where they need a guest lecturer? The options are many, it just takes some efficient brainstorming and the ability to adapt to new ideas. I keep coming back to this often in my articles, and will also make an own article on where you can submit these. Told in short, there are tons of stock-sites and similar where people can earn money from snippets, illustrations, flash-files, photos, logo designs and more. iStockphoto is an example is probably the best known site. Not only can you upload pictures there but also videos, illustrations, sounds and logo designs. This isn’t a guaranteed source of income in any way as people actually have to find what you’ve uploaded useful and be willing to pay for it. On the other hand though, if you have lots of files of good quality just collecting dust in your system, this option is better than just deleting them or leaving them there without getting to use. There are people who make good money from these things and every dollar you make will be a nice bonus income. If you choose the right websites this is also great marketing for yourself and you can even get new clients this way sometimes. Another good thing about this is that once you’ve uploaded and tagged the files they will live their own life and be a source to possible “passive” income. Other pieces of work you can earn money from this way can be WordPress themes, articles, lyrics and backgrounds/wallpapers. A tip within this tip is to also look at the option of selling some of these from your own blog/website. If you have good traffic on your site you can upload and sell some of these things from there. Could be worth a try. Make sure your portfolio is updated with your best and recent projects. It’s always a good idea to show that you are versatile aswell. 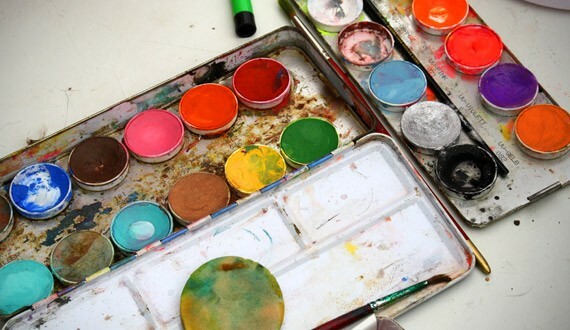 This point is also a part of the earlier mentioned “Spring cleaning article” but you should aim to always keep your portfolio up to date, no matter what time of year it is. It can be a bit of work though, so use dry times to get the actual updating done if possible. It’s an investment in your future. Look at past goals and see if you have reached them or not. Find new programs and routines to work even more efficient. Read up on freelancer related blogs and write down new tips to things you haven’t tried before. you meet them or not later on. If your goal is 25 000 $ a year for example, break it down to months, weeks or days for easier evaluation. Set plans for looking into other things mentioned in this article, like side-niches, the possibility to sell stocks and so on. In most markets the evolution is at high pace. It’s always a good thing to take some time researching what’s out there plus reading up on new trends and related topics. Online resources are endless but don’t forget to read books and magazines as well. I spend a lot of time watching video tutorials related to programs I use, followed by practising what I just saw being done. It’s never a bad thing to devote some time into getting better at what you do. You will never come to the point where you are perfect but you can always get better than what you are. So don’t let the lack of projects stop you from working with the programs you have. Make sure everything is up to date regarding invoices, plans, savings and bills. This also means making decisions related to your current slow period. Do an overall evaluation of the current situation to see if you have to put more into savings to cover up for times like these. And as little as you may want to it can at times be necessary to look at the possibility of getting a part-time job if these dry periods are long and/or occur often. This tip is one of the tips that many freelancers forget, but those who remember it often succeed. Contact clients you’ve worked for in the past and hear how they are. Many times this contact from you reminds them of things they have that need to be done. They will also most likely love the fact that you remember them and keep in touch. As long as you don’t cross the line of seeming desperate and annoying this tip can be what gets you that extra project you need right now. If you have your own website/blog it can in busier periods be hard to get the time to keep it updated. If you want new clients and readers it’s important that they see you update your website occasionally. Write up a post or more related to what you do. Schedule the ones you don’t publish right away for later and you have done something that definitely isn’t a waste of time. I do this occasionally myself and it feels great to be on top of things this way. Write about subjects that interest you. Being a freelancer there’s a good chance that maybe some website might be interesting in publishing you as a guest blogger. Competition is usually hard but don’t give up. If you write well and have a passion for what you write about it will shine through. There are many websites that offer payment for guest blogs and/or a link back to you in the article so you can both get paid and get some valuable marketing at the same time. There are also websites like Constant Content where you can upload articles you’ve written on various topics and potential buyers can browse through them and hopefully buy them aswell. Also there’s always the option of making tutorials related to your trade. Several places pay for these aswell if they’re well done. Remember that the more things you have out on the internet, the more chances you have of making new connections, getting new ideas or even making money directly from it. Most of us have various open personal projects that we never get the required time to work on. It being your wedding website, some logos, cartoons, artwork, articles or other things. If you’re having a slow week at work this is definitely something you should consider working on. Not only can it turn into something you can make money on and put in your portfolio but it will also inspire you. And the feeling of doing something you love is just priceless anyway. There are hundreds and thousands of forums and message boards related to freelancing, design, art, finances and so on. By registering to these and reading up on things you can find tips from others who are or have been in the same situation as you. You can also some places submit your work for reviews, ask questions and socialize with other members. You can get help, find new tips, connect with new people, get inspired and maybe find new clients. There are many advantages to get from this. Those were my 15 tips for slow days and dry times. I hope you found some of them useful and as always I would love to hear your feedback and your own tips in the comment section below. Now that you know where to look for gigs and what to do when the times get though, let’s look at Ramit Sethi and what does he have to say about earning more money. Ramit Sethi is the New York Times best-selling author of I Will Teach You To Be Rich and the author of the popular personal finance blog I Will Teach You To Be Rich, which hosts over 250,000 readers per month. Ramit’s advice has been featured in the New York Times, the Wall Street Journal, FORTUNE, NPR, ABC News and CNBC. Ramit graduated from Stanford and co-founded PBwiki, a venture-backed startup. He’s a man worth listening to if you want to make it as a freelancer. My name is Ramit Sethi. I run a website called I Will Teach You To Be Rich. I wrote “The New York Times” best selling book “I Will Teach You To Be Rich”, which focuses on how to manage and automate your money using psychology and systems.. And for the last few years, I’ve been teaching people how to earn money on the side using the skills they already have (e.g. web designers, photographers, project managers..). What is your own experience with freelancing? I’ve freelanced as a writer. I’ve freelanced as a marketing consultant. I’ve done some freelance work for venture capital firms. I’ve even freelanced as a private consultant. Why did you decide to teach people about freelancing? “I didn’t plan to teach material on freelancing, but.. I went on a book tour on 2009. I visited a lot of different cities across the United States. In almost every single place that I went to I met my readers and asked them “What do you wish I wrote more about?”. Almost all of them said “I want to earn more money. Yeah, I want to invest and do all that stuff, but I also want to learn how to earn more money”. I went back to my team and we started researching all the different ways to earn money (..negotiating a raise in your current job, getting a better job, freelancing, creating products and selling them online..) and from this research, as well as from my own experience, I think that freelancing is the most effective way to earn more money (especially on the side). How exactly do you help your students who are web designers? “A lot of web designers feel frustrated. They’re getting these terrible clients who don’t want to pay and are saying things like “Why would I pay you, I can just go online to some theme site and get it for 20$”. They’re getting these terrible projects that require a ton of work for not that much money. Moreover, they spend most of their time chasing new clients. As you can see, it’s very frustrating for them. What I help my students to do is to first narrow down who they’re targeting. Many web designers have a funny idea that they should target as many people as possible, cast the widest net, because then they can potentially get more clients, but, counter-intuitively, it’s much more effective to really narrow down who you’re going after. I’ll give you an example. Let’s pretend that you’re a new mother. Let’s pretend that you just had a beautiful baby son and you want some photos taken of you and your new son. Who are you going to hire? Are you going to hire John Jones, who takes photos of babies, animals, barnyards and cars? Or are you going to hire Richard Johnson, who specializes in baby boys between the ages of one week and three months. Who are you going to hire? It’s obvious that you’re going to hire the person who specializes in that and you’ll be willing to pay more, because the second photographer understands all the particular unique challenges and ways to make a baby boy look beautiful. Agota’s note: Here’s a case study about one of Ramit’s students, a 20-something web designer Mike, who earned extra 6000$ in eight weeks by using some of the Ramit’s techniques. Okay, so before we get into the freelancing stuff.. A lot of people, especially creative types, hold this belief that “money is evil”, which prevents them from earning more and living the life they deserve. What would you say to people who want to overcome this limiting belief? Look, think about something that you have paid for that you love. Maybe it’s that lipstick you buy. Maybe it’s that restaurant you go out to. Maybe it’s somebody who helps you clean your apartment, or does your laundry, or makes the product you love, whatever. Think about how happy you feel when you pay. You know, there’s always one or two things in our lives that we’ll pay anything for, right? Well.. Why can’t that be you? Your clients will be delighted to pay you if you can help them solve their problems, make more money, save time or get more clients. When we have these invisible beliefs we often believe that we’re cheating someone and that there’s only a limited amount of money in this world, so we’re taking it away from someone. However, if you’re actually helping your clients, if you’re putting them at the center of your business, you’re actually helping everyone create more. Not scarcity, abundance! 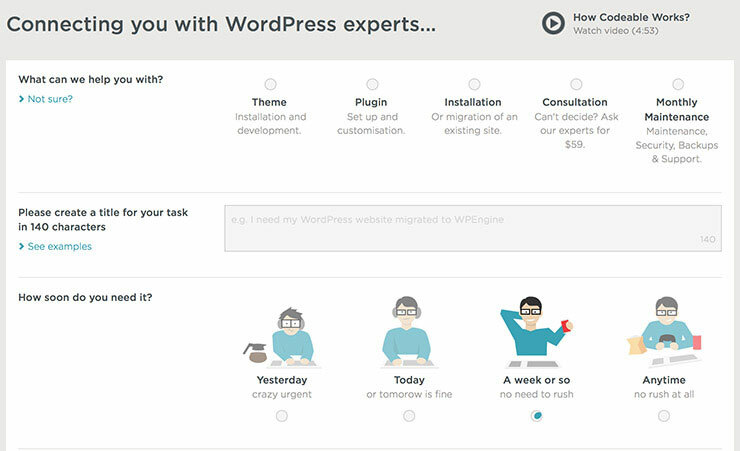 You’re actually helping them get more clients, create more revenue, save more time. They’re happy to pass a small percentage of that to you. Get three really high value clients and watch and observe as they’re more than happy to pay you, because you are solving their problems. Also, in order to conquer this limiting belief, study people who are successful and don’t surround yourself with people who think that money is evil. Okay, great, so back to freelancing.. Most people who have full time jobs and family responsibilities are crazy busy already and they don’t want a second job on top of all that. How can these people find time to freelance? Honestly, is it even realistic for them? 1. Implementing The Retainer’s strategy. One of my students, Dean Soto, actually has a very demanding full-time job in a technology industry, as well as a family with children. He didn’t want to take away from his family time, but he also knew that he wanted to earn a little bit more money to provide a better lifestyle for them. He took that Earn1k module on pricing, where we talk about how to charge in different ways, and he implemented The Retainer’s strategy. Now, what this does is he basically works with the best clients, who don’t need him at any particular time, they just want him to get things done. This way, Dean gets to come home from work, play with his family and still earn money on the side by spending about an hour every couple of nights working for his clients. He can do that early in the morning, he can do that late at night. His clients don’t care:they only want him to get things done. That allowed him to earn thousands and thousands of dollars. That’s one way, implementing The Retainer’s strategy. The second way is to optimize your time. We teach this in Earn1k. Most of us waste hours and hours per day. HOURS! Did you know that the average American watches several hours of TV everyday? Needless to say, there are a lot of ways to optimize our time. There’s a whole bunch of time management strategies that we outline, but in general, I’ll just say, could you find a way to save 30 minutes a day? Are there certain things you could do, for example, could you batch certain things, so you would do them all at once instead of spread out? Could you cut back on one thing that you’re doing that is not very productive? Could you wake up 30 minutes earlier? Maybe you could pay someone in order to outsource something that you do? Let’s assume you’re making 50$/hour (I’m just making up a number here). Paying someone 10$/hour to do the same thing, or to do, let’s say, your laundry, can be a very effective time arbitrage. So that’s No.2, optimizing your time. 3. Work for higher end clients. This is what I push my students to do. Many of web designers reading this (I know, because I’ve spoken to so many) know that it can be really frustrating to have to spend hours and hours every day on a project when you’re only getting paid a tiny amount for the work that you’re doing and you’re not getting paid what you deserve. Well, part of the reason for that is that you’re working with the wrong clients. My students who are successful and go through the program find that they’re spending the same amount of time (or even less), yet making far more money. Why? Because they’re working with clients who are happy to pay them their asking rates. So, it all comes back to how you’re helping the right clients find success. ..so you’re saying that it’s possible to earn a decent amount of money with only 5-10 hours a week (decent being more than 100$/week) ? Let’s get into “how-to” part. What is the very starting point for someone who has a full time job as a web designer and wants to start earning money on the side (..and maybe someday switch to full time freelancing)? What’s the very first thing to do? “Start by understanding what skills do you have that someone would be willing to pay for and who these people might be. This is a big foundational thing that many people miss. They start off by saying “Oh, I have this idea, I’m gonna start by getting business cards and setting up a website!”. This stuff happens much later. What matters first is being able to find those clients that might pay and really talking to them, listening to them, finding out what their big challenges are. This is where customer research comes in. This is why my students are able to charge so much: a lot of them go from charging 10$/hour or 15$/hour to charging over 100$/hour. The difference is that they start doing a really deep research. They ask questions like (let’s say they’re looking for web design clients): “Why do you want a web designer?”, “Have you already hired one in the past?”, “Did it work out?”, “Did it not work out?”.. They’ll also do a research on their market: “Who are the other designers who are doing what I want to do?”, “How much do they charge?”, etc. They’re not just walking and talking about their idea. 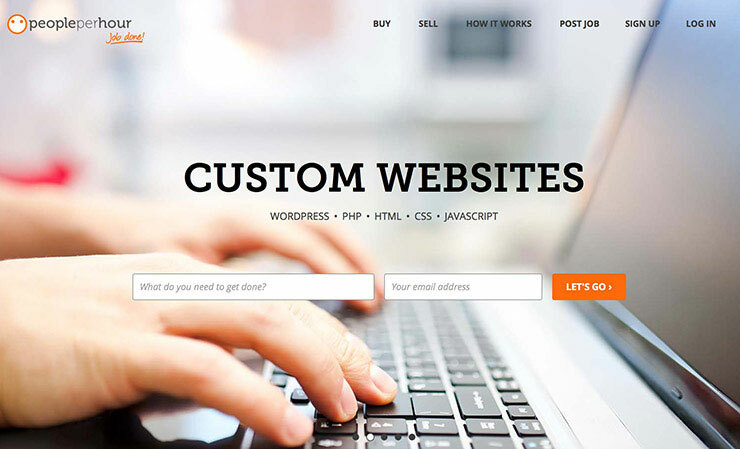 How can web designers niche it down and define their ideal customers? How niche they should target? That’s a great question. In general, they should niche it down more than they are. When I ask you “Who’s your ideal client?”, you can’t just say “Someone who needs a web page or a small business owners”. That doesn’t mean anything. That’s everyone. How are you supposed to find those small business owners? However.. What if you said: “I want to find small business owners who run information product marketing companies, doing revenues between 100k – 1mil per year.”? Well, guess what? It’s much easier to find those people and, by the way, those people are willing to pay, because you have skills that can help them earn more revenue. We have this technique called Pay Certainty technique when it comes to niching it down. It’s a very simple principle which you can use right now. You know how a lot of web designers don’t know who they’re serving, so they’re just serving everyone? Or you have web designers who will say: “Oh, I want to go do web design for non-profits”..and they almost never make any money? That’s because they haven’t used something like this. 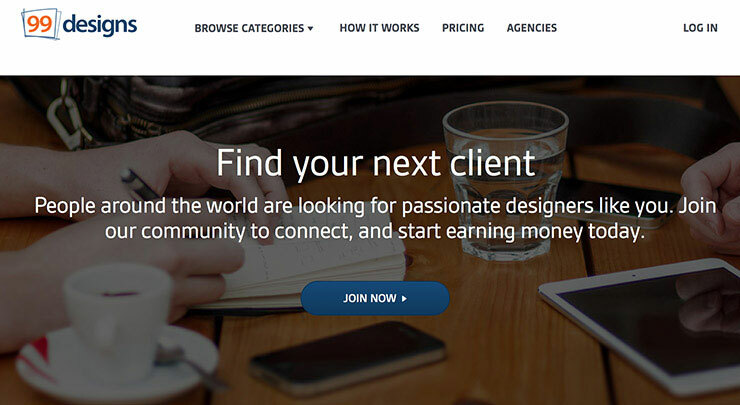 You say: “I want to serve non-profits who want a new web design”. Let’s try to test this. Do the non profit clients have the ability to pay? No! They really don’t’ have that much money, so probably not. Do they have the willingness to pay? No! They don’t want to pay someone for web design, really. They want to trade or barter or just get it for free. So they fail the pay certainty technique. ..but what if you say: “Hey, I want to find a company who needs an improved design, they’re a small business in an automobile industry and they need an improved design to sell more cars. Oh, and they do revenue between 100k – 500k a year.”. Do they have an ability to pay? Yes, they make 500k a year. Do they have the willingness to pay? Yes, they want to make more money! They’re willing to pay a little bit. THAT is how you start niching it down..and that’s how you spend less time getting more clients. What would you say to people who are just starting out as freelancers and are afraid to lose opportunities/lose customers by niching it down and think that they should take everything that comes their way? It’s a classic fear and it’s one of the quickest reasons why most web designers don’t really earn what they should. My simple answer is: try. Try it for one or two months and see if it works. Just try it, if it works, great! However, if it doesn’t work, if you find it challenging to find clients who are willing to pay what you’re asking and you find it difficult to raise your rates, then perhaps it would make sense to try a different way. I can tell you that this isn’t just something that I’ve used, this is a classic marketing principle and thousands of my students have also used it to earn significant amounts of money. It seem counter-intuitive, because you’re saying “No” to people, but.. Think about it in a different way . Think about as if you are looking for a relationship. Do you just go out and say: “I want to marry EVERYBODY!” or are you a little bit more selective? You don’t go after anyone who has two eyes and a nose. You say, “You known, I’ve certain values, certain things that I look for in a man or a woman”. You try to find out whether you are a good fit for each other. I think so many web designers try to focus on everyone instead of focusing on the right people because they lack self-esteem, as well as marketing skills. ..by the way, I do this with my own courses. One thing I do is I don’t try to appeal to anyone: I actually don’t allow people who have a credit card debt to join my flagship courses. Almost nobody does that. Not allowing people with a credit card debt join my courses costs me hundreds of thousands dollars per years. I think it’s the right thing to do. I don’t think that people with my credit card debt should be joining my very expensive courses. I think they should use my book or my free material to pay off their debt first. It shows people that I don’t want everyone’s business, I just want the right business. When you do that, you actually stand for far more than just money..And, ironically, you can actually charge much higher rates by focusing on the right people. You always say “Get your first 3 paying clients!”. How can web designers do that? How do you actually go and get those clients? So many web designers just waste their time. They do things like get on Twitter, create a Facebook page and make business cards. How does any of those things help you get clients? They don’t. In most cases, none of these things help you get clients. You think client is going to randomly find your Twitter page and then decide to pay you thousands of dollars? That’s not how it works. I know, I have over 30 000 Twitter followers. So, eliminate time wasters and focus only on the things that are going to get you your first three paying clients. When you start setting something up, ask yourself: “Is this going to help me get 3 paying clients?”. No? Skip it. Do it later. ..for example, a lot of people want to build a massive website that’s going to take them three months. Skip it! You can set up a simple page or not even have a website. Well, web designers probably need websites and they need portfolios, but for other folks, they don’t need that. Do you really need business cards or can you just point them to your website? You get the idea. Many people are guilty of what I call the “I, I, I” syndrome. They walk up to their clients and say “I can do this, I can do that..”. The client doesn’t care about you. They care about themselves, so what can you do to help them? Have you studied their business? Have you already come up with a list of suggestions of how you can help them? One of the most powerful ways to get a client is this: you walk into a meeting, ask about their challenges and then pull out a sheet of proposals that you’ve made from studying their website. This is called The Briefcase technique.. And it has closed people massive contracts. 3. Reach out to them directly. Don’t wait for them to come to you, go to them! “Hey, I’m a web designer, I wanted to see if there’s any possibility of me helping you out with few things, I’m more than willing to give you some suggestions on how to improve your copy..by the way, I have done this for another clients, who recorded a 55% increase in revenue.”. Whoa, that’s pretty compelling! The clients will definitely take your call and now you can talk to them, listen to them and perhaps make some suggestions. That’s how you can go about getting your first three clients. ..by the way, there was this concept of features vs. benefits which has helped me tremendously in getting new clients. Maybe you can explain it to our readers? Most people focus on features. They say: “Here’s what you get with my web design service: you get a hosting account, you get ten pages design, you get this, you get that”. Well.. The client doesn’t care! What do the clients want fundamentally? They want to make more money, they want to get more clients, they want to spend less time, they just want it handled.. You can find this out by talking to them and doing research. ..by the way, this is a survey that I actually used to drive well over a 100k in revenue, your readers can check it out here. This is where you start doing your homework. You figure out what it is that they want and use it to present your services as a benefit. So, instead of saying “You get 10 web pages”, you say: “Look, my goal is to help you increase the number of subscribers by 25%” or, better yet, “My goal is to help you increase the revenue by 15%”. That is a benefit. Nobody cares about how many pages it is, or how much time you’re going to spend on it or what software you’ll use. They don’t care about all that. They want more money, more clients, in less time. Focus on what THEY want, not what you want. 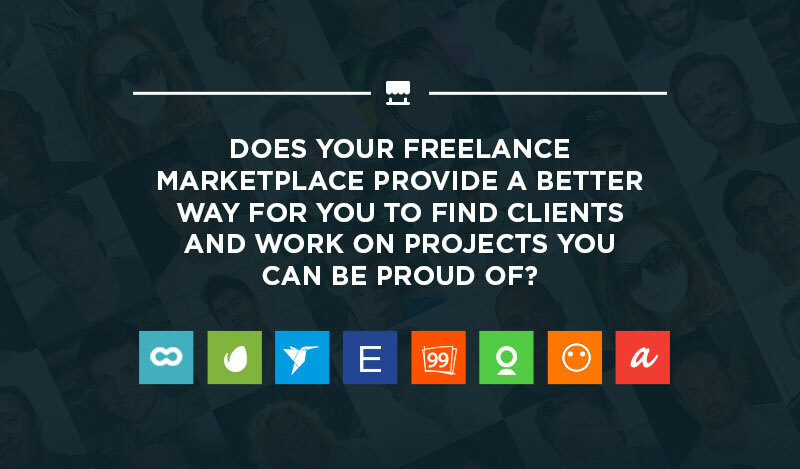 Many freelancers find it very challenging to decide what to charge for their services. When to work for free, when to charge and what to charge? Let’s start by talking about working for free. You know, I actually believe that working for free can be great if you do it for the right reasons. I’ve worked for free for many people and it has helped to accelerate my career a lot, but..
We’re all too well aware how often creative people get taken advantage of. You know, they’ll go and work for someone for free and they’ll get nothing out of it. Moreover, the free guy wants more and more and more and he gets mad when you don’t deliver. It doesn’t make any sense. So, here’s what I would suggest..
1. When you want to build up a portfolio. “You know, I normally charge 75$/hour, but I really like your project and right now I’m looking to build a portfolio, so I’m happy to work on this for free for two weeks. All I ask is if in at the end of those two weeks I do an extraordinary job, that we discuss going back to my normal rate”. That’s a good way of positioning yourself as a trusted high end provider, but also doing some free work to let them see how good you are. 2. When you want to work for someone who’s a connector. “Look, I’m willing to work for free, but my goal is if I do an extraordinary job for you, I’d like you to recommend me to three of your friends”. People have actually done that for me and I’ve sent them so much business that they didn’t know what to do with it. The same thing for some other of my friends, somebody worked for them for free, these connectors connected them to multiple clients. However, you always have to be upfront. ..so you’re saying that it’s better NOT to work for free indefinitely, without that upfront agreement? Okay, so the next thing is how much you should charge. You can find this out by finding out what your competition is charging. 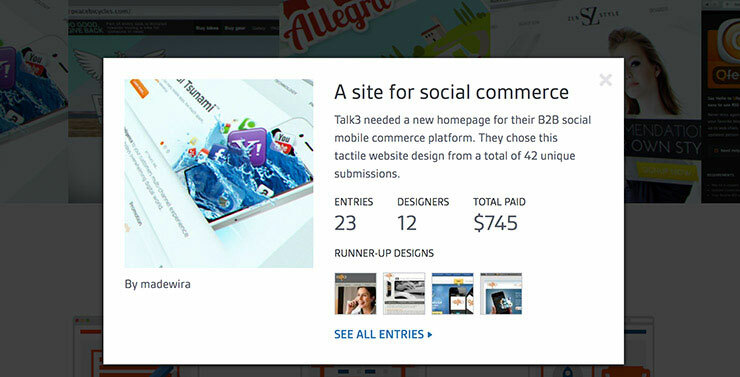 Again, if you think that your competition is every web designer in the world, you have to go much narrower than that. It pays to know who your competition is and what they’re charging. I explain how to do this in my Earn1k course. Also, focus on the value. For example, if you come to me and say: I’m going to increase your sales by 15%”, you can charge me anything!.. and I’ll pay it, as long as you actually deliver. So, the better you are, the more examples of successes you have in the past, the more you can charge. Let me just put it this way: I told you what my hourly rate is, right? I’m not charging that to everybody, in fact, I turn away a lot of people who can actually afford that, because I only work with people who I think I can add a lot of value to. Think of your favorite restaurant. The restaurant where you go and there’s always a line at the door. They probably could squeeze in few more tables, but they don’t, because they don’t care about serving everyone, they want to only serve the clientele they want. When you start positioning yourself as that, not just a commodity designer, but someone who these clients are lucky to have because you’re so skilled at what you do, then you can start at the top of that range to let them see how good you are. You’ve mentioned that you’ve increased your own rates significantly over the last few years. How can freelancers increase their rates over time? I bet a lot of people are scared to raise their rates. It’s interesting how many of the questions are about fear, isn’t it? There’s fear in charging a reasonable rate, there’s fear in raising our rates, there’s fear in focusing on niche customers and turning away other clients.. However, fear is not a good way to run your freelancing career. The very best freelancers know precisely who they are targeting and they’re very comfortable with saying “You know what, you’ re probably not the right fit for me”. Isn’t it interesting that so many web designers run their careers instead of actually studying people who have done it really well? I mean.. Let’s just challenge you: when was the last time that your freelancing friends systematically studied the best freelancers in their field:talked to them, took them out for coffee, studied their websites to learn how they charge and position.. When was the last time they did that? ..I think they haven’t done that all.. Yes. They’re governed by fear instead. It’s not a good way to go through life and certainly not a good way to go through your career. I had a young woman who worked for me. She started by doing some pretty basic stuff, but over time, she was so good at what she did that she started asking me: “Hey, what else are you doing, what else is going on in your business, how else can I help?” and she started doing several other things. Over time she added so much value to my business that of course I ended up paying her more, I ended up paying her tens of thousands of dollars more. Why? Because she added value to me, the client. She made my life easier and she showed the ROI. Here’s something I want to say to freelancers and web designers in particular: you’re not just designers, you’re solving their problems. So, for example, if you find that they need help with their copy writing, either you can do it or you can refer them to someone who can. You’re solving their problems. Maybe they need help setting up and e-mail management software. You say: “Oh great, I know how to use Aweber” (or whatever you can), set that up and of course charge them. They’re happy to pay. Remember, you’re not tricking them. They’re happy to pay. Somebody who talks about it very well is a guy named Jay Abraham, he’s one of my mentors, he says: “Don’t just talk about YOUR services, put THE CLIENT at the center”. So, if they need something, figure out if you can offer it or if you know someone who can. After you do this time and time again, your client will think about you as their problem solver .. And that is an enviable position to be in. Is there a way to systematically expand your client base once you got your first 3 paying clients in order to make sure that there’s always freelance work available? There’s a way. It takes a lot of work, but there is a way. The best freelancers I know always have a waiting list of clients. They actively turn people down, because they’re not the right fit, or they’re not willing to pay, or they just don’t have time. Now, I don’t want this to sound intimidating, because if you’re first starting out, it can seem insane to have a waiting list of clients. However, all of this are simple steps taken day after day and applied systematically. So, how do you do that? You get those 3 paying clients. You decide whether you want to charge your existing clients more or you want to get more clients. That’s how you get more clients. There are several other sophisticated ways, like partnerships, referrals, constant lead generation, etc. Anyway, there are plenty of ways to get more clients once you got 3, 5, 7, clients. It’s actually much easier to go from 10 to 20 clients than to 1 to 3 clients. We cover all this in Earn1k. Talking about clients.. Many freelancers, especially those who are just starting out, waste a lot of time and energy working for really bad clients. Is there a way to know in advance that a client is going to be a time waster? What are the danger signs? Well, first of all, a lot of creatives get taken advantage of by people and yes, we can blame them, but really, we need to blame ourselves. When was the last time someone in a creative world, like web designers or photographers, actually took time to learn how the business works? Instead ,a lot of creatives insist “Oh, I just need to get better at my craft and then the money will come”.. Well, that’s not how it works! I made these mistakes too, but if you simply expect the right clients to find you.. That’s not how the world works. That’s why I teach what I teach: I’m so frustrated of creative people getting taken advantage of. 1. Observe whether the client is clear about the project. Bad clients often spend enormous amounts of time talking about the project instead of actually focusing on what needs to be done. What I suggest is that you have a very clear questionnaire and a set of guidelines for your potential clients. This actually comes from studying the most successful freelancers. The best people have limited time, so they ask potential clients to fill out a questionnaire which shows that a client is serious. Don’t get on the phone for no good reason, just to chat about the project! 2. Mention the ballpark of certain work you’ve done in the past. It’s okay to mention the work you’ve done in the past and what you’ve charged for it, because if you are charging 15 000$ for a project and the client has 500$ budget in mind, you need to find that out relatively soon. It doesn’t mean that you have to put it on your website or that you need to ask about it on your first call, but you need to be honest with them about the type of work you do. 3. Be very clear about what you’re going after. It always comes back to your clients. Are you going after anyone? Or are you using things like Pay Certainty technique to eliminate 90% of time wasters and find people who have the ability and willingness to pay? When you can do that, you’re working with a much smaller group of people who are way more qualified. I have 300 000 readers a month. However, when I did a launch a couple of years ago, I made something like 80% of my revenue from my small list of 2000 people. Let me say this again: I have 300 000 readers a month, but when I did this launch, I made 80% of my revenue from my small list of 2000 people. In other words, going after the right people can be dramatically more effective than going after everyone. I bet quite a few people would love to eventually become full-time freelancers. How can someone go from having a full time job and freelancing on the side to freelancing full time? I love the idea of freelancing on the side because it’s not as risky as jumping out and starting something on your own. I think that if you have a full-time job, it’s a great idea to spend little more time getting some clients on the side, because you can actually de-risk your own situation. Think about it: if you have a full time job and you’re fired or laid off, that’s it, it’s 100% of your income. However, a lot of my students have 4,5,6 sources of income, so even if they’re laid off, they still have have revenue coming through the door.. Also, they can still manage their time very well, because they’re working with their best clients and putting in as much time as they want. I want to de-risk my situation before I make the jump from a full time job to a full time freelancing. That means I want multiple clients: not one, not two, but three or more clients paying regularly. I want to have money in the bank. I want at least a few months worth of money for those cold winter days, because sometimes you just don’t have any clients, so what are you going to do? You need some savings. Well, if I only had three clients for the last six months and I can’t get a fourth one, that’s not a good situation. I want to get more and more clients paying more and more to me and me delivering more and more value, because that means that I really understand how to get more clients and deliver more value. Last, but not least, maybe you could tell our readers a little bit more about your course on freelancing? Who is it for and who it is not for? What they should expect? Where they can find more information about it? I committed to teaching my readers the system I used to make money on the side and raise my rates to $3,000 an hour. Like successful personal finance, the way to earn more money on the side is to follow a step-by-step system that other freelancers and businesses have already proved works. I developed my course to help people to get their first three clients and earn $1,000 a month on the side because I knew from my psychology research those first steps were the hardest. Since then, I’ve tested the course on thousands of students who followed the steps to earn more money, pay off debt, and even quit their day jobs and go into work for themselves. Well is been a long ride but hopefully worth it. We are trying to get the best advice’s to you and get the best out of you, so that you can and believe us, you can make money from something you love to do. Keep striving and good luck until next time. Web Industry Job Titles: Where Do You Fit In?